Synopsis: Set in a futuristic dystopia where society is divided into five factions that each represent a different virtue, teenagers have to decide if they want to stay in their faction or switch to another – for the rest of their lives. Tris Prior makes a choice that surprises everyone. Then Tris and her fellow faction-members have to live through a highly competitive initiation process to live out the choice they have made. They must undergo extreme physical and intense psychological tests, that transform them all. But Tris has a secret that she is Divergent, which means she doesn’t fit into any one group. If anyone knew, it would mean a certain death. As she discovers a growing conflict that threatens to unravel her seemingly perfect society, this secret might help her save the people she loves…or it might destroy her. After the success of The Hunger Games franchise and the Twilight movies, it should surprise no one that Hollywood wants to turn every Young Adult book into a movie. It’s even better for the studios if that book is part of a series. The newest attempt at capturing the hearts of teens everywhere is Veronica Roth’s “Divergent” Trilogy and its first adapted book, Divergent. Divergent takes place in Chicago after a post-apocalyptic war has ravaged the world. Society is divided into five different factions; there’s the intelligent Erudite, the honest Candor, the peaceful Amity, the selfless Abnegation, and the courageous Dauntless. Every child must undergo testing to see which faction best suits them, and they can either choose to join that faction or pick another. Beatrice Prior (Shailene Woodley from The Descendants and The Spectacular Now) was born into Abnegation, but has never felt a part of it. Her test results are inconclusive, making her a dangerous foe of the government – a Divergent. When her time comes to choose a faction, she chooses Dauntless, who are the protectors of the city, acting as both police department and military force. She rechristens herself ‘Tris,’ and goes through training with the Dauntless, taught well by a leader named Four (Underworld: Awakening‘s Theo James) who has taken a liking to her. 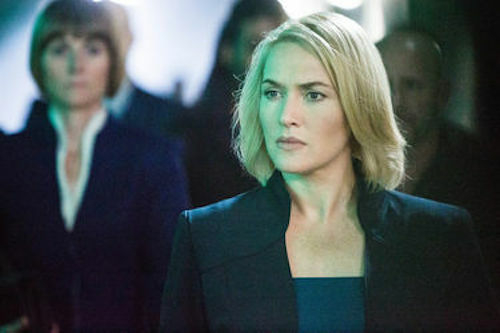 Before long, Tris and Four uncover a sinister plot; the brainy Erudite, led by the resourceful Jeanine (Labor Day‘s Kate Winslet), want to use the Dauntless as soldiers to take over the government. 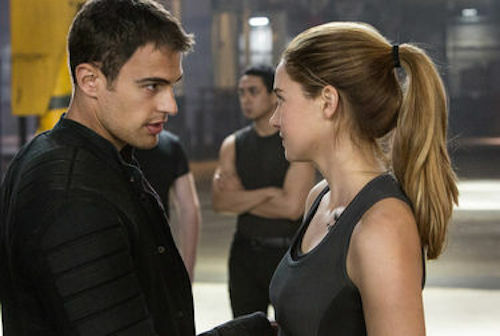 Tris and Four must stop the plot without letting anyone know that Tris is Divergent. By most accounts, Divergent is a swing-and-a-miss. It’s overly long and plodding, and there’s really nothing there that hasn’t been done to death before. Director Neil Burger (Limitless) does craft a few cool scenes and set pieces, but the post-apocalyptic world of Divergent feels too familiar and tedious. As a technical film, it’s pretty good. It is well shot and competently acted. The effects look good and the production design looks great. None of this can make up for the long stretches of extraneous dialogue and superfluous scenes. The story is just not there, so Divergent comes off as a triumph of style over substance, and that’s not a victory of which anyone should be proud. As with any film released right now that takes place in a futuristic dystopia, Divergent begs for comparisons to The Hunger Games, and those comparisons would not be unfounded. In both films, the population is split into groups depending on their social and economic responsibilities, with The Hunger Games‘ districts being replaced by Divergent‘s factions. Both movies have a central theme of families being split apart due to government intervention and oppression. When Tris joins the Dauntless, she undergoes a vigorous and extensive training program that is not unlike Katniss’ training sessions for the Games. Although Tris and Katniss have similar journeys, The Hunger Games is a far more compelling film. There are two more Veronica Roth books to adapt in the “Divergent” Trilogy, “Insurgent” and “Allegiant,” but if Divergent is any indicator, the odds will continue to be ever in The Hunger Games‘ favor. The chief fault with Divergent lies in its writing. Veronica Roth’s book was adapted for the screen by Evan Daugherty (Snow White and the Huntsman) and Vanessa Taylor (Hope Springs), and it is an obvious setup for a trilogy. For the first two acts of the movie, very little happens. It’s all setup, but its setup for another movie; by the time any resolution is given, the end credits are rolling. The Divergent Trilogy is shaping up to be more like The Lord of the Rings than Star Wars; the films will not stand as well on their own as they will as a part of a whole. Another issue with the script is the dialogue. Just about every spoken line is on-the-nose, and there is very little subtext in the words. It may work okay when the Dauntless leaders are explaining to a big group of people what is about to happen, but when Tris and Four are hooked up to a computer that simulates their biggest fears, the audience doesn’t need to hear one of them say “fear of heights” or “a closed-in space!” They can figure it out without being told. Let’s hope that the next two movies give the audience a little more credit. The music for Divergent was written by Junkie XL (AKA Tom Holkenborg, who has also done the scores for and 300: Rise of an Empire) with a little help from Dave Fleming (Hansel & Gretel: Witch Hunters). It’s interesting to note that Hans Zimmer (The Dark Knight Rises) is credited as Executive Music Producer, because the actual score bears more than a passing resemblance to some of Zimmer’s more cinematic soundtracks. The team of Junkie XL and Hans Zimmer appears to be a solid one, as the score is a cool blend of futuristic electronic music and traditional film compositions. Of course, because the target audience is teenagers and the movie needs a soundtrack album to sell, there are pop songs peppered throughout the film by the likes of Ellie Goulding and Snow Patrol, but the entire musical landscape of the picture is organic and well done.